Affordable Central Texas (ACT), the investment manager and sponsor of the Austin Housing Conservancy Fund, a local open-ended private equity investment fund that preserves affordable multifamily rental housing for moderate- and middle-income Austinites, announced today it has received a $450,000 operating grant from St. Davids Foundation. We’re incredibly grateful to St. Davids Foundation not only for the grant, but for their continued support, said David Steinwedell, CEO of Affordable Central Texas. We share a common goal to increase Austinites access to opportunity, whether that means proximity to good schools, transportation options or employment, and Im eager to explore the positive impact that stable housing can have on Austins moderate- and middle-income workforce. Affordable Central Texas is among 41 nonprofits that received grants totaling more than $18 million from St. Davids Foundation in December 2018. The grant to be distributed to ACT over two years will be used to improve operations, assess residents educational, health care and financial needs, and determine and measure the impact of the Funds property purchases. Its our vision to make Central Texas residents the healthiest people on the planet, said Earl Maxwell, CEO of St. Davids Foundation. As rent prices increase, our teachers, first responders, nurses and others are pressured with a choice nobody should ever have to make: housing or opportunity. By partnering with ACT, we want to make sure Austins workforce has a stable place to live and access to opportunity. To learn more about Affordable Central Texas, visit www.austinhousingconservancy.com/about. To learn more about the Fund, visit www.austinhousingconservancy.com. Affordable Central Texas, a 501(c)(3) nonprofit, is the sponsor and investment manager of the Austin Housing Conservancy Fund. ACT was formed in 2016 by a group of highly experienced Austin real estate, finance and affordable housing professionals. ACT has been the recipient of several recent operating grants from the St. Davids Foundation, TEGNA and SynerMark Properties in addition to previous grants from the Michael and Susan Dell Foundation, Wells Fargo, Seton and IBC Bank, as well as contributions from numerous individuals. For more information, visit www.affordablectx.org. The Austin Housing Conservancy Fund is an open-ended social impact private equity fund. The first of its kind to provide long-term moderate- and middle-income housing preservation, the Funds purpose is to purchase and preserve affordable multifamily rental housing for Austinites. Raised, funded and deployed in Austin, the Fund delivers risk-adjusted financial returns through flexible, discretionary investments that directly benefit Austins teachers, nurses, first responders and other core workers. For more information, visit www.austinhousingconservancy.com. St. Davids Foundation is one of the largest health foundations in the United States, funding more than $70 million annually in a five-county area surrounding Austin, Texas. Through a unique partnership with St. Davids HealthCare, a Malcolm Baldrige award-winning hospital system in Central Texas, the Foundation reinvests proceeds from the hospital system back into the community, with the goal of building the healthiest community in the world. St. Davids Foundation also operates the largest mobile dental program providing charity care in the country and runs the largest healthcare scholarship program in Texas. This article was featured on the Community Impact Newspaper website, a link to this article can be found here. In November, University of Texas senior Allie Nunas founded the West Campus Neighborhood Association. As in most Central Austin neighborhoods, West Campus is majority-renter. Census data from 2017 found that 54.7 percent of city residents rent; in some Central Austin ZIP codes, the portion is much larger. Everywhere, it is likely to grow as home prices continue to skyrocket, wages remain stagnant and student loan debt swells. However, tenant advocates, academics, researchers and city officials agree the concerns of property owners often overshadow those of renters, who also face challenges of affordability and representations. In 2018, the median home price in the city of Austin was $375,760, per the Austin Board of REALTORS. This price is out of reach for most residents, who often have to choose between renting in the city or buying property somewhere more affordable, such as Manor, where the median home price in 2018 was $187,000, or Elgin, where it was $203,900. Despite these barriers, renters often face “second-class” status, said Shoshana Krieger, project director of Building and Strengthening Tenant Action, or BASTA, a local nonprofit that helps tenants organize. 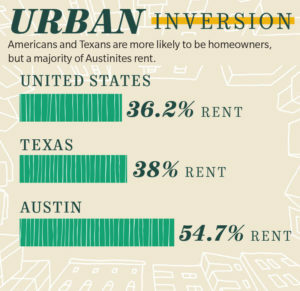 A growing portion of Austin renters are cost-burdened, or spending more than 30 percent of their income on housing, the amount recommended by the U.S. Department of Housing and Urban Development. In 2015, 25 percent of four-person households earning between $34,550 and $82,920 were cost-burdened, up from 9 percent in 2000, according to a 2017 report by the Urban Land Institute. The cost-burden rate for those earning less jumped from 69 percent to 91 percent in the same period. The increasing cost-burden rate is the result of many factors, including a lack of adequate affordable housing in Austin and the high cost of new development. According to the Austin Strategic Housing Blueprint, which Austin City Council adopted in 2017, the city needs to construct 135,000 housing units over 10 years to meet demand—with 60,000 of those units affordable to families making 80 percent of less of the area’s median family income. This is an expensive proposition. “You can’t build brand-new rental housing at a price that is affordable to people in this income bracket,” said David Steinwedell, CEO of the local nonprofit Affordable Central Texas, citing the cost of land, labor and permitting delays. Like homeowners, renters searching for affordable housing in Austin have few good options. “A lack of housing is a real challenge to renters because if you don’t have anywhere to go. You’re at the mercy of your landlord,” Casar said. Austin homeowners also have advantages—tax benefits such as the homestead exemption, the ability to capture some of the rising value of their home by selling—that make them “much less vulnerable to displacement” than renters, according to the 2018 report “Uprooted,” which City Council commissioned to study displacement and gentrification in Austin. “[L]owering property taxes for homeowners would help low-income homeowners remain in their homes but also shift more of the property tax burden to landlords, potentially contributing to increased rents and hurting Austin’s vulnerable renters,” the report found. Property taxes are the main revenue source for the state of Texas, a burden that falls most squarely on the shoulders of property owners. State lawmakers have acknowledged this and on Jan. 31 introduced two bills that would allow voters to roll back tax rates if local property tax revenue exceeds 2.5 percent year-over-year growth. “We can no longer sit idly by while homeowners are reduced to tenants of their very own property with taxing authorities playing the role of landlord,” Texas Gov.Greg Abbott said in January 2018 while campaigning for re-election. Renters shoulder these costs, too, if property owners raise rent to cover increasing tax bills, but they lack the protections and political agency of homeowners. “Tenant protections in the state of Texas are minimal at best,” Krieger said, citing laws that prohibit inclusionary zoning, which requires private developers to subsidize affordable housing on-site; source-of-income protections, which prevent landlords from discriminating against tenants who receive housing vouchers; and, in nearly all cases, rent control. Neighborhood associations in Central Austin, which are influential among council members, tend to be dominated by homeowners, said Elizabeth Mueller, an associate professor at the University of Texas School of Architecture and co-author of the “Uprooted” report. “We do have a lot of people who are longtime tenants living in neighborhoods throughout Austin. But we don’t do a good job of making sure they’re included in neighborhood associations,” Mueller said. Some Austin neighborhood associations stipulate in their bylaws that voting memberships may only be open to homeowners, such as downtown’s Judges Hill Neighborhood Association. Frustrated with these dynamics and some of the decisions being made by the 45-year-old Hyde Park Neighborhood Association, a group of area residents formed Friends of Hyde Park in 2015. The association is free to join, offers online voting to encourage participation and counts approximately equal numbers of renters and owners as members. “If we didn’t have our second neighborhood association as a dissenting voice, you just don’t have that same sort of power structure that has influenced city of Austin politics for so long,” President Pete Gilcrease said. Still, renters may have reasons to be optimistic. Austin City Council now has three renters among its ranks—Paige Ellis, Jimmy Flannigan and Natasha Harper-Madison—up from just one in the prior term. Its members have also committed to finding solutions for cost-burdened residents, most notably by presenting a $250 million affordable housing bond to voters, 74 percent of whom supported it. The bond includes $94 million for affordable rental housing. And Austinites are organizing in new ways, whether with the help of BASTA, in Hyde Park or on campus. “We live here, too,” Nunas said. This article was featured on the Culture Map Austin website, a link to this article can be found here. David Steinwedell, CEO of the Austin Housing Conservancy, a local, open-ended private equity investment fund, is on a mission to preserve the city’s naturally occurring affordable housing and help keep Austinites in their homes. Steinwedell, who has 35 years of real estate experience and is the former executive director of the educational and research nonprofit, Urban Land Institute, has seen both the positive and negative consequences population growth has had on the city. On a mission to provide relief, and with backing from Mayor Steve Adler, the Austin Housing Conservancy wants to secure continuous stable housing for thousands of Austinites. Thus far, Steinwedell and his team have purchased three multifamily buildings around the city. With rent prices steadily increasing, more and more Austinites have become rent-burdened, a term Steinwedell explains as one’s rent account for 30 percent or more of total monthly income. That is what the Austin Housing Conservancy is fighting against. The three buildings under the Austin Housing Conservancy today are for those making approximately 80 percent of the median income, in layman’s terms, around $48,000 a year for a one-person household. The first building is near Wells Branch — a timely acquisition. With the announcement of the new Apple headquarters, rent prices in the Northwest Hills and Wells Branch neighborhoods have already risen by 10 to 20 percent, says Steinwedell. In the last decade, the naturally occurring affordable units have been disappearing at an alarming rate to make way for luxury apartments and condos. While Steinwedell knows that those luxury high rises are meeting a market demand, it does put more pressure on the working class. “Ultimately we want to figure out how to build new properties that are affordable,” he says. “Right now, it’s so expensive to build anything that you can’t charge rents that are affordable. Currently, the Austin Housing Conservancy is an Austin-focused fund, but in the future Steinwedell hopes to branch out to other large cities such as San Antonio, Dallas, and Houston, making Texas as a whole a more affordable place to live for all. If you’ve lived in Austin even just couple of years, you’ve probably noticed it’s getting more and more expensive. There’s construction all around. New apartments are going up to meet the demand of a growing city and older apartments are taking in new residents. So, it’s a great feeling when you find an apartment that has just what you’re looking for, but not everyone is so fortunate, many can’t afford today’s rents. “A teacher who is in AISD can’t afford now to live anywhere close to the school they teach in,” said David Steinwedell, president and CEO of the nonprofit Affordable Central Texas. “Usually their kids move and go to a different school system and eventually the teacher says, why am I commuting back and forth? Why don’t I just go teach in the Dripping Springs School District or the Elgin School District, now you’ve lost not only a teacher but you’ve lost a lot of students,” said Steinwedell. Austin’s rent prices are reaching new heights. Zumper, a platform that helps people find apartments, shows the average cost of a one bedroom is now more than $1,200 per month. A new report from Rent Café shows last year the city’s prices went up $57 per month from the year before. That’s $15 higher than the national average. “If you look at a map of what we own in three or five years, what we really hope it looks like is there’s dots everywhere,” said Steinwedell. For years, traditional commercial real estate investors stayed away from investing in residential of any kind, citing low returns and repetitional risk. Then the private rented sector took off and drew them in. Now, they are venturing into a sector that was really out of bounds: affordable housing. Social impact investing is on the up. CBRE Global Investors last month announced it had raised £250M of equity from 13 investors for the CBRE UK Affordable Housing Fund. The amount of equity exceeded its target. Hedge fund manager Man Group has poached Shamez Alibhai from Cheyne Capital with a view to raising a fund to invest in social housing and associated sectors. Alibhai ran Cheyne’s £250M Social Property Impact Fund. Franklin Templeton this month made the first acquisitions for its €158M pan-European Franklin Templeton Social Infrastructure Fund, including a medical clinic in London. While returns from affordable housing are low, they are also stable and predictable, which is driving the influx of interest. “It is in the newspapers every day — there is a big structural mismatch between the demand and supply of affordable housing,” CBRE GI Head of UK Funds Hannah Marshall said. CBRE GI’s fund is open-ended and has a target return of 6%, which Marshall said is appealing to institutional investors because it matches their need for long-term income. CBRE GI is not setting up its own registered provider (the government-regulated entity required to invest in the sector directly in the UK) but instead it will partner with these bodies and housing associations, which will manage the assets. It will forward fund new developments and invest in standing assets, including social and affordable rented housing, shared ownership and other tenures such as key worker housing and homeless hostels. It will stop short of any assets where the operations include the provision of care. Marshall said CBRE GI would not be looking for assets with index-linked leases, but instead would share the risk of income linked to government policy. From the point of view of being good for the world, CBRE GI is working with advisory firm The Good Economy to create a way of measuring the fund’s social impact, both at the point when acquisitions are made and over the course of the life of the fund. Such standards do not exist, and have to be created from scratch. Great coverage of Affordable Central Texas by the Austin Business Journal! Photo of The Preserve at Wells Branch courtesy of the Austin Housing Conservancy.